There are numerous examples throughout history of effective nonviolent action. Nonviolent protesters defied the Soviet Empire's communist rulers, Gandhi's nonviolent revolution defeated the British Empire, and Martin Luther King Jr.'s peaceful civil-rights crusade changed American history. Recent scholarship shows that nonviolent revolutions against injustice and dictatorship are actually more successful than violent campaigns. 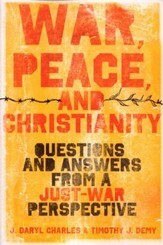 In this book, noted theologian and bestselling author Ron Sider argues that the search for peaceful alternatives to violence is not only a practical necessity in the wake of the twentieth century--the most bloody in human history--but also a moral demand of the Christian faith. He presents compelling examples of how nonviolent action has been practiced in history and in current social-political situations to promote peace and oppose injustice, showing that this path is a successful and viable alternative to violence. Ronald J. Sider (PhD, Yale University) is the founder and president emeritus of Evangelicals for Social Action and distinguished professor of theology, holistic ministry, and public policy at Palmer Theological Seminary in Wynnewood, Pennsylvania. He is the author of numerous books, including The Early Church on Killing, the bestselling Rich Christians in an Age of Hunger, and The Scandal of the Evangelical Conscience. Every once in a while a book substantially changes the conversation, and even the posture, of the church. What Ron Sider's Rich Christians in An Age of Hunger did to change how Christians think about poverty, Nonviolent Action promises to do for how we think about war. This book is for every person who is appalled by evil but conflicted in how to respond to it in a way that honors Jesus, the Prince of Peace. It is not just for pacifists. It is for skeptics, war hawks, liberals, and conservatives--but is not for the faint of heart, for in the end it is a clarion call to take the cross as seriously as we have taken the sword. Ron Sider's powerful blend of scholarship and passion has gripped me! In recent years I've traveled often to the Holy Land, where unholy violence continues to beget more violence. This book affirms the wisdom of the peacemakers I've met--both Israelis and Palestinians--who refuse the path of violence. With their active witness in mind, I fully endorse Ron's call to an organized, active campaign of nonviolence. When Ron Sider talks, I listen. When he writes, I read. Whether or not one is a pacifist--I am not--one has something to learn about the power of nonviolent protest and resistance from Dr. Sider's careful and thoughtful study of successful nonviolent movements against tyranny and oppression. He shows that sometimes nonviolence is the most effective way--and therefore the right way--to overcome injustice and protect its victims. In my view, that isn't always the case, but Dr. Sider does the Christian community and everyone a great service in reminding us that sometimes nonviolence is the best option. This wise, balanced, and inspiring book is a richly instructive guide for all who have pledged their allegiance to the Savior who is also the Prince of Peace. Gandhi and King are not anomalies. Ron Sider shows that these outstanding witnesses to nonviolence are part of a long and often-successful tradition. Unfortunately, nonviolence has not been given the large scale study and trial it deserves. I hope this book of case studies inspires more people to seek the knowledge and training that Christian action for justice requires. Ron Sider provides a profound and illuminating account of the effectiveness of nonviolent, grassroots movements that challenge unjust and discriminatory social practices. He concludes with a summons to faith communities to equip themselves for generating and sustaining such movements in their own responses to oppressive social systems that abuse vulnerable human beings in the contemporary world. 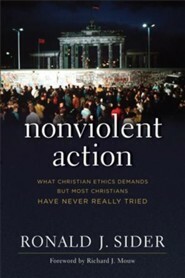 In Nonviolent Action, Ron Sider presents a compelling case for vastly increased investment by Christian churches and other faith traditions in the development of effective nonviolent strategies for resisting violent oppression and accomplishing social change. Creative thinking, solid training, and significant budgetary allocations could move nonviolence to the central role it ought to play. This convincing book makes an important contribution to a critical debate. Despite the unprecedented violence of the last century, the twentieth century also saw many dramatic successes for nonviolent resistance movements. In Nonviolent Action, Ron Sider eloquently and persuasively describes how and why these movements have been so effective. He then compellingly argues for the need to embrace nonviolent action on a scale never before seen as we look towards the future. There are few people better qualified to write a book on this topic than Ron Sider, whose steadfast work for peace and justice for more than forty years never ceases to inspire me. I encourage anyone who cares about the future of humankind and wants to live out Jesus's call to be a peacemaker to read this book. 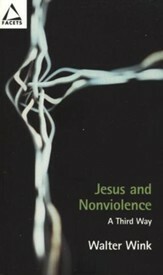 Thoroughly documented and clearly written, this book recounts how nonviolence has worked both in cases that are generally known and in cases that deserve greater attention. 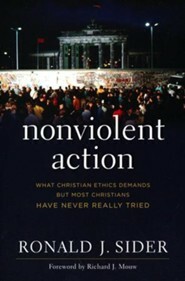 It explains how all persons can discern nonviolence to be both strategically and morally preferable to violence. It will be a valuable resource for understanding peacemaking as a needed skill. This book is an inspiring addition to Ron Sider's magisterial collection of writings, and in many ways a capstone to his consistent witness for peace. 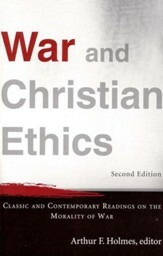 I strongly recommend this important contribution to the literature of Christian peacemaking--that is, Christian discipleship. The facts are in: nonviolent action is often more effective than the use of force in the quest for justice. Sider argues powerfully that both pacifist and just war Christians should join together in struggles for such nonviolent change. A powerful book. Ron Sider is a vigorous and well-informed advocate for nonviolent action as the best way forward as we confront the deep problems of the twenty-first century. He brings his comprehensive knowledge of both just war theory and pacifism to bear on an impressive range of case studies from British India in the 1930s to the Arab Spring of the 2010s. 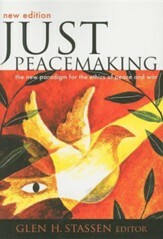 I am happy to recommend this book very strongly both to peace activists who are looking to deepen their historical and theological knowledge of the basic issues and to theologians who are searching for a more experiential and pragmatic approach than what a simple reiteration of pacifist convictions offers. I'm the author/artist and I want to review Nonviolent Action: What Christian Ethics Demands but Most Christians Have Never Really Tried.